Avery Dennison Workers Deserve Justice! Avery Dennison workers in Bangalore, India have been paid unequal wages for over a decade. When the workers stoodup for their basic rights on the job, and organized with League member Garment and Textile Workers' Union (GATWU), 52 were illegally dismissed! Sign the petition to call on Mitch Butier, Avery Dennison CEO, to respect the rights of the workers who made the company over $6.6 billion in profits just last year! Support the Avery Dennison workers now! » See the latest news on Adidas Workers Unite! 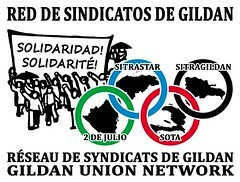 We also have formed the Gildan Union Network, a regional campaign in Central America and the Caribbean led by workers of the Canadian company Gildan Activewear and its contractors. Take a look at our photos from protests by Gildan workers in Haiti, Honduras, Nicaragua and the Dominican Republic on July 24, 2012.